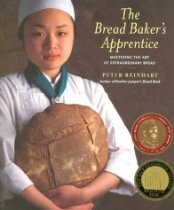 Last week when Nicole of Pinch My Salt casually tweeted about starting a challenge to bake every single bread in Peter Reinhart’s masterwork The Bread Baker’s Apprentice, I didn’t even think. My subconscious took over and my fingers seem to type of their own accord, “I’ll take on that challenge.” I’ve had the book in my personal collection for a few years and have attempted several of the breads, some on my own and some as Daring Baker’s challenges. His Napoletana pizza dough has become a regular in our kitchen and every time I make it I want to break into a rendition of That’s Amore or Funiculì, Funiculà. Though I’ve failed the first time around on some of his formulas (er, the bagels), I now have a chance to redeem myself…hopefully. Well, there’s a bunch of us doing what we now call the BBA Challenge, about 200 to be exact. Yes, the challenge went viral, but we decided to be relaxed about it and just have fun. We’re working loosely on a schedule of one formula per week going through the book in order from beginning to end. 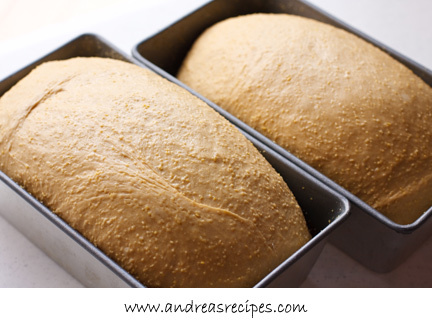 The first challenge is the Anadama bread. 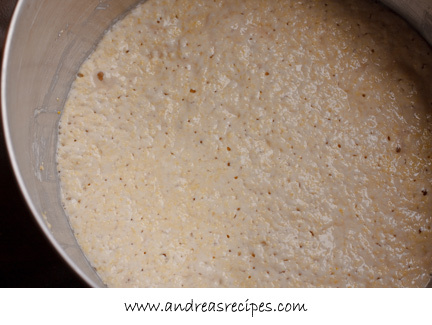 Each week I will post a photo journal of the loaf or loaves I made that week. After today, my posts on the challenges will be mostly wordless posts, merely an opportunity to show what we’ve been working on. For more bread inspiration, check out the BBA Challenge photos in the BBA Challenge Flickr photo group. 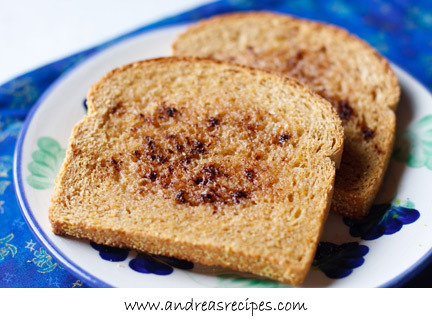 Anadama toast with butter, cinnamon, and sugar. Brings back delicious memories of my childhood. Beautiful bread. Loved your write up. 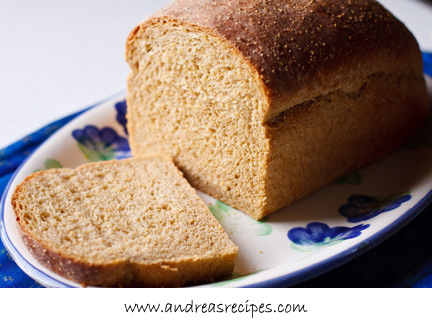 andrea, beautiful photos, and the bread looks very tasty. well done! 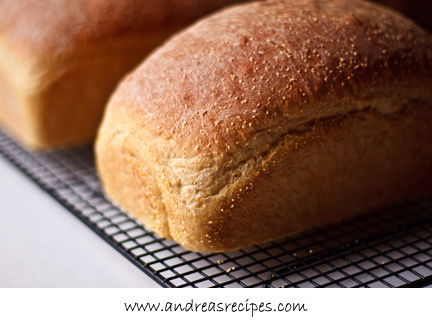 Such a gorgeous dome you got on the loaf Andrea! Really a wonderful bread. Your subconscious took over … I like that! They are so perfect looking! Great job on your Anadama. Obviously you are up for the challenge! Nice photos! Bread looks really good Andrea. Congrats. This is SUCH A GORGEOUS loaf, Andrea. Great job! Loaves look fantastic! 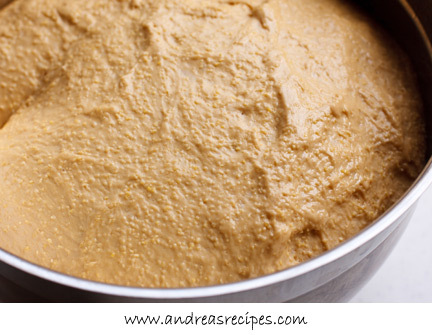 Nice pics…Happy Baking! Great job with the challenge! This bread looks just lovely! The last picture with the butter, sugar and cinnamon reminds me of growing up too! I’m not great at breads but I do so love reading about other people’s creation and yours look wonderful. It’s like a picture out of Peter Reinhart’s book. Beautiful! After I joined the group I thought “What am I doing…I don’t know how to make bread!” I like this group & look forward to learning and baking with everyone. I was looking forward to the bagels… what problems did you have with them? Cinnamon sugar toast? Heaven! Those are some fabulous looking loaves! Hi Tammy. I’ve only done the Reinhart bagels once. I inadvertently let them rise for too long so they didn’t hold up when they went into the hot water. This time I plan to keep a sharp eye on the rise and be more gentle with transferring into the hot water. I know I am months behind everyone, but if anyone notices this comment I would love a little help. This is maddening as I have managed to get to a point where I am getting solid ciabatta and baguettes consistently. I figured this would be a sunday night cake-walk to tackle.